Juvenile spondyloarthropathy includes both differentiated and undifferentiated forms. The differentiated forms include juvenile ankylosing spondylitis, reactive arthritis, psoriatic arthritis, and arthritis with inflam-matory bowel disease. Enthesitis-related arthritis (ERA) is now the preferred term for undifferentiated forms of juvenile spondyloar-thropathy. Most juvenile spondyloarthropathy patients present with asymmetric oligoarthritis involving the knee, hip, ankle, tarsal, metatarsophalangeal, or foot interphalan-geal joints. Enthesitis — pain, tenderness, and swelling at the site of attachment of tendon, ligament, or fascia to bone — is the most common feature of juvenile spondyloarthrop-athy. 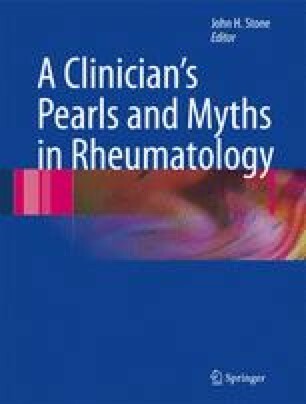 The frequency of this finding has led to the term “ enthesitis-related arthritis” (ERA). Monoarthritis of one of these joints, particularly one of the large ones, is also common disease presentation. Axial involvement seldom begins less than 5 years after the clinical onset of juvenile spondyloarthropathy. Some patients with ERA are at high risk of developing ankylosing spondylitis. These include males, patients who are HLA-B27 (human leukocyte antigen B27) positive, and those with early arthritis of the hips, ankles, or sacroiliac joints. Acute anterior uveitis and inflammatory bowel disease are common extraarticular manifestations of ERA.